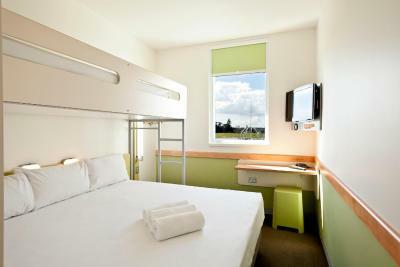 Lock in a great price for ibis Budget Auckland Airport – rated 8 by recent guests! Bright breezy fun decor, liked reception/downstairs layout. Good breakfast choices. Great place for a one night stay before an earl morning departure or late arrival. Super convenient location. Pretty basic, but clean. Not the most comfortable beds, but more than sufficient. Close to stores. Bus stops right outside the door. Security in the lift with the card. Good location with shopping and restaurants close-by. It was a great location close to the airport. We were only at the hotel for about 7 hours total, so it was a very brief visit between our arrival and the next flight in the morning. 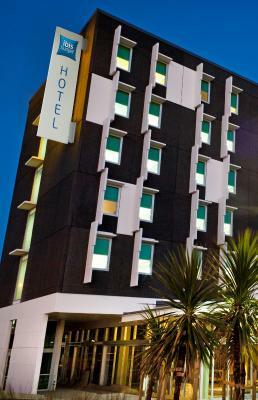 ibis Budget Auckland Airport This rating is a reflection of how the property compares to the industry standard when it comes to price, facilities and services available. It's based on a self-evaluation by the property. Use this rating to help choose your stay! 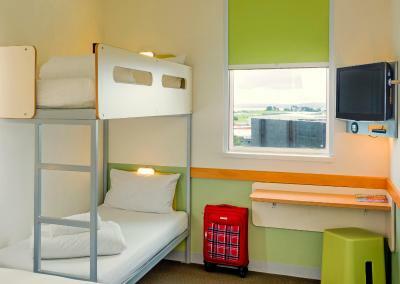 Just 2,950 feet from the domestic and international terminals at Auckland Airport, ibis Budget Auckland Airport features modern rooms with a flat-screen TV. It offers a 24-hour front desk and an internet kiosk. Airport shuttle services are available for an additional charge. The property is within easy walking distance to the shops, cafés and restaurants. Nearby attractions include Villa Maria Vineyard, Butterfly Creek, Adventure Park and Treasure Island Adventure Mini Golf. 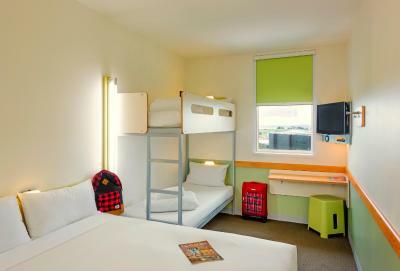 Ibis Budget Auckland Airport is a 30-minute drive from Auckland city center. Free car parking is provided for 1 night. The bright rooms feature a queen-size bed and an overhead single bunk bed. All rooms have a private bathroom with shower. Guests have access to vending machines for snacks and drinks. 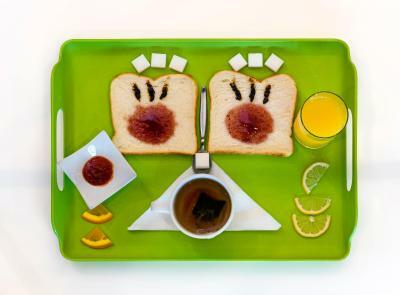 Breakfast is served each morning. 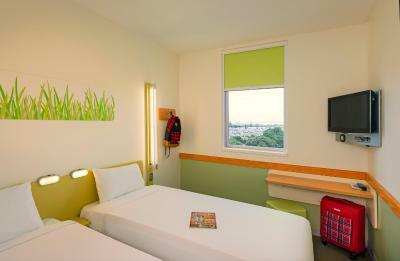 When would you like to stay at ibis Budget Auckland Airport? This standard room features a king-size bed. There is an private bathroom and a flat-screen TV. This room includes a king bed and overhead bunk bed or two single beds and overhead bunk bed. The modern room features an private bathroom, flat screen TV and WiFi access (with surcharge). This Family Room includes a double bed and two single bunk beds. The modern room features an private bathroom, flat screen TV, air conditioning, alarm clock radio and WiFi access (with surcharge). 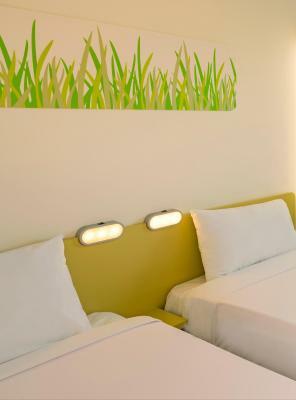 This modern budget room includes a queen bed, private bathroom, flat-screen TV and WiFi access (with surcharge). 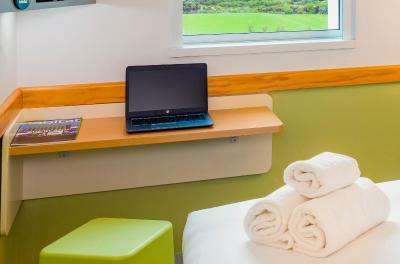 This modern budget room includes two single beds,an private bathroom, flat-screen TV and WiFi access (with surcharge). Simple, bright and modern, the 198 accommodation rooms have been designed with both families and individual travellers in mind. WiFi is available in all areas and costs NZD 15 per 24 hours. House Rules ibis Budget Auckland Airport takes special requests – add in the next step! ibis Budget Auckland Airport accepts these cards and reserves the right to temporarily hold an amount prior to arrival. Please note that the shuttle service is not available between 1:30-3:30 in the morning. For domestic travelers, the bus arrives every 30 minutes - between exit doors 3 and 4. The collection point for international travelers is outside the main arrivals door at the public bus stop. The shuttle is NZ $6 per person from the airport to the hotel. It is NZ $5 per person from the hotel to the airport. Children under 12 years old are free. Super convenient location. We walked from the airport to hotel. With supermarket and cafes downstairs. The room and property overall was clean. Proximity to airport. Convenience of restaurant and bus to airport. Very small room, no space for opening up luggage must put on the bed. No hair blower. Extra charge for shuttle bus. The room was too small. Movement in the room was very limited. Nothing really, although free continuous WiFi would be great. Great hotel if you have an early flight the next day or arrive in late. Walking distance to both terminals. Clean and comfortable. An ideal overnight stay before your flight. Well priced and ideally located. Everything you need. Rooms are small but ok. Ideally should have some sturdy hooks or wall shelves so that there is a place to put things other than on the ground. There wasn't a hairdryer. Very welcoming helpful staff and the communal hangout area beside checkin was very vibrant and modern with free coffee tea etc. and real milk available. Good shower nice and hot and good water pressure Szimplas restaurant right next door was a great place for a meal. Good selection of high quality food but quite reasonable prices and again fast and friendly service. The location was great - close to the airport for that early morning flight! Bed was very comfortable. There was also plenty of places to eat and a supermarket close by. The blue airport transfer was quick and convenient.